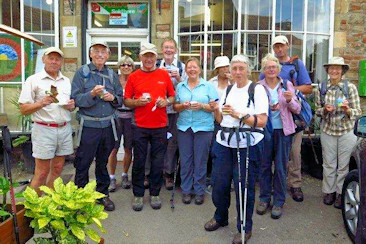 in spite of saying they would not lead another Long Distance Walk after completing the Ice Cream Walk in 2014. Wysis is an invented word derived from Wye to the Isis (as the Thames is called on Oxford). Perhaps we should have called it the Siswy walk! On 9 November 2013 we started doing The Ice Cream Walk over 12 months. 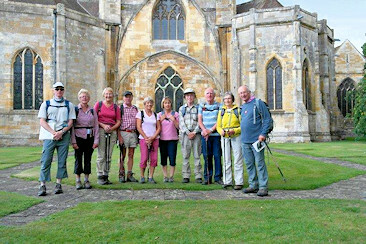 On Saturday 7 September 2013 a group of walkers from South Cotswold Ramblers completed a trek of the 100-mile-long Gloucestershire Way. The choice of route was influenced by local poets, particularly Ivor Gurney and FWHarvey who provided its theme of "Forest and Vale and High Blue Hill". It commences in Chepstow, crosses the county via May Hill and Crickley Hill to Stow-on-the-Wold, then doubles back through Winchcombe to Tewkesbury where it finishes at the Abbey. Our walk was completed in approximately 10-mile-long stages over about 18 months, and the picture above shows usat the end of the walk outside Tewkesbury Abbey.